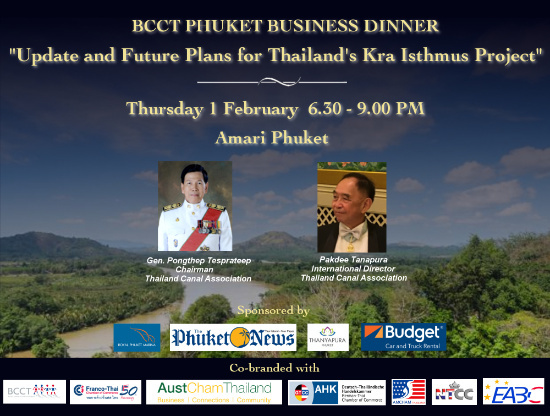 BCCT, in collaboration with FTCC, AustCham, GTCC, AMCHAM, NTCC and EABC, would like to invite you to Phuket Business Dinner on Update and Future Plans for Thailand's Kra Isthmus Project on Thursday 1 February 2018 at Amari Phuket. With a long history of Kra Canal studies and agreements, Kra Isthmus Project is one of the most controversial projects in the history of Thailand. Will Thailand make it this time? Many Thais hope that the gigantic investment of 55 billion US$ to begin with, would help jumping start Thailand's economy. It would also create a ripple effect among the ASEAN countries which would benefit from such as ambitious development. Besides, the Kra Canal will also be the solution to the congested Straits of Malacca, the busiest Sea Lane of Communication in the world. It is estimated that once the Canal is constructed, it would generate free flows of trade and development between the Indian and Pacific Oceans. India and China are projected to be the two giants of growth for the 21st Century. According to the latest poll conducted by the Songkhla University, about 74% of Southern people from 14 provinces have already agreed with the construction of the Canal project. Will the Thai Government agree to the suggestion? Can Thailand wait any longer? Will Thailand change? Cost & Payment: THB 890 including inter-buffet & soft drinks. Happy Hour from 5-9 pm 50% of all drinks including beer at THB 70 per glass and wine at THB 100 per glass. Food & beverages on guest's own account. Payment at the door direct to hotel. If you require tax receipt from the hotel, please present your company detail and tax ID at registration. Royal Phuket Marina is a premier lifestyle destination combining Phuket’s most exclusive residences, state-of-the-art marina, fine dining, exhibition hall, health club and commercial rentals. Asia’s most sophisticated high-tech yachting haven, Royal Phuket Marina is the proud holder of several international awards, including the prestigious 5 Gold Anchor Award bestowed by the British Yacht Harbour Association. Royal Phuket Marina is a playground in itself and its gorgeous setting makes simply strolling along the boardwalk a pleasure! Thanyapura Health and Sports Resort home to the finest sports facilities, integrative health centre, mindful services and expert coaching, situated on the beautiful tropical island of Phuket. We are committed to improving your athletic performance and overall health, inspiring your mind and instilling well-being – all in order to help you optimise your life.